Delinquent Robot Productions is an exciting new media company specializing in animation, video production and are working on a range of innovative interactive learning games for children. Derek Joyce, founder of Delinquent Robot Productions has over 17 years experience with the animation industry and has worked on many video production projects over the past several years. Delinquent Robot Productions approached me to design their logo along with business cards, letterheads and compliment slips. I have designed their logo to reflect the identity of the company: the delinquent robot head and shoulders. 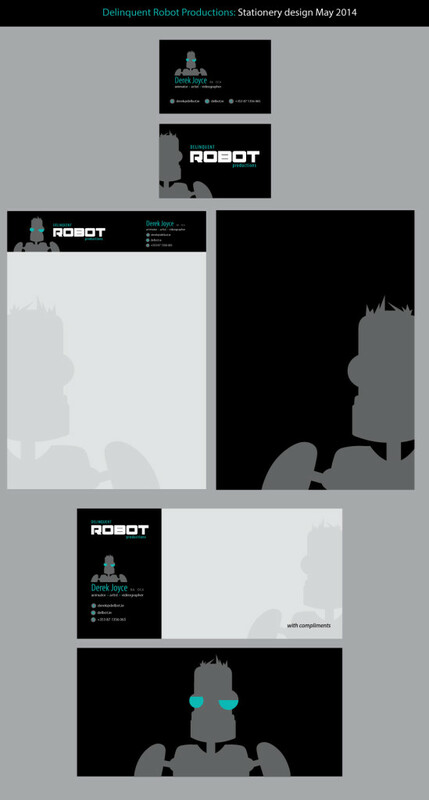 Derek had already designed the delinquent robot graphic and choose black, grey and turquoise for the color scheme for all their company projects. I took the minimalist approach to designing the stationery range with the logo appearing highly contrasted against the black background. The robot itself a medium grey which is easily visible, yet not overpowering. The images below show the finished front and back designs for the business cards, letterheads and compliment slips. I have always wanted to view the Northern Lights, unfortunately it’s very rare for them to be visible from my location in Ireland as I am too far south, but some day I plan on visiting northern Norway to catch a glimse of this amazing spectacle. This video shows the northern lights in action and shows how magnificent this can be!. I have been creating barrymccaffrey.com over the past while to showcase all the projects that I have worked on during my 4 years at the Institute of Technology in Blanchardstown studying Creative Digital Media, as well as projects I have completed while working with Safefood 360. I really like modern, clean design and wanted to create a website & blog that would reflect my interest in design. I created the website from scratch using html5 and css3 without using front-end framework development platforms such as Bootstrap as I wanted to learn the web design process from scratch. Once I was happy with my wireframes, I developed mockup designs using Adobe Illustrator and then moved on to developing the website using Adobe Dreamweaver. Once the the main sections of the website where developed, I then wanted to create my blog page with the same look and feel as the website. I created a child-theme which would provide a seamless transition between the website and blog.